Sugarpot Beauty: Review! 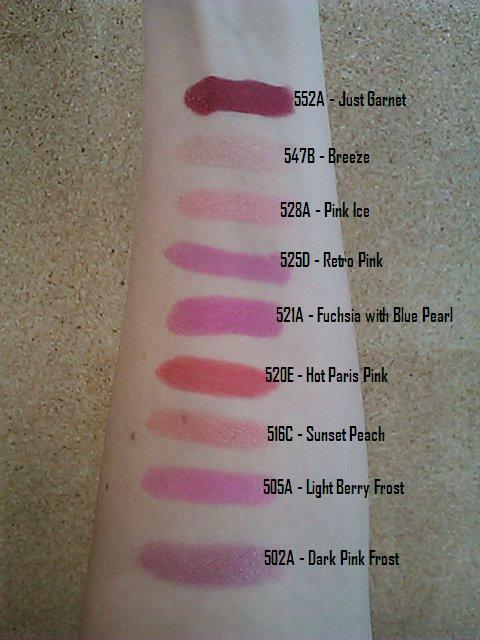 Wet N Wild Silk Finish Lipstick - 9 colors with swatches! Review! Wet N Wild Silk Finish Lipstick - 9 colors with swatches! Enriched with conditioning ingredients of Vitamins A & E and Aloe Vera for moist-looking lips." Seriously, that's it. Which is unfortunate, because this is actually a pretty nice formulation. There's no funky smell, and to me it smells very, very, very faintly of a minimally scented soap. It glides on smoothly, and feels light and soft on the lip. It is not overly moisturizing, but it is not drying, either. I usually have a bit of lip balm on my lips before putting on my lipstick, but I can go without it and not have to worry about my lips drying out. The shimmer is nice, and not gritty. I like shimmer and shine (but not frost) to my lipsticks, and these fit the bill. There are two colors on here with "Frost" in the name, and they are leaning towards frost, but to me they don't quite make it there. In other words, it doesn't feel 80's to me, it feels like a more modern "frost". When I think of "frost", I think of white glowy shimmer, and this is more like a clear white sparkle. The lipstick is sheer with a light swipe, but all of the colors build easily without getting clumpy. It has a nice pigmentation. Wear time varies, but I usually get about 2 hours with the lighter colors, and about 4 hours with 552A - Just Garnet. The darker colors do stain a bit. Because the colors start off sheer, your natural lip color will affect the tone unless you put on a heavier application, or wear a lip base. The packaging is cheap. There's no other way to say it. The lipstick does not swivel all the way (not even mostly) down the tube, so you have to be careful with the cap or you'll gouge a chunk of it out. 552A - Just Garnet ----- SEE LIP SWATCH HERE! 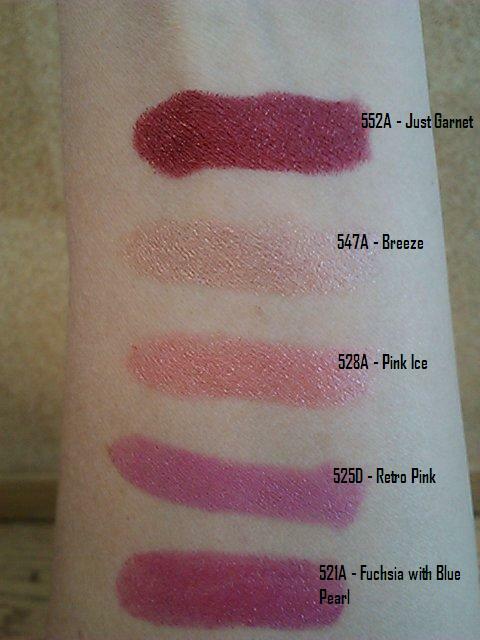 547A - Breeze ----- SEE LIP SWATCH HERE! 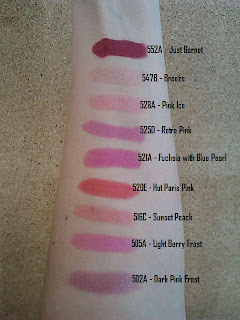 528A - Pink Ice ----- SEE LIP SWATCH HERE! 525D - Retro Pink ----- SEE LIP SWATCH HERE! 521A - Fuchsia with Blue Pearl ----- SEE LIP SWATCH HERE! 520E - Hot Paris Pink ----- SEE LIP SWATCH HERE! 516C - Sunset Peach ----- SEE LIP SWATCH HERE! 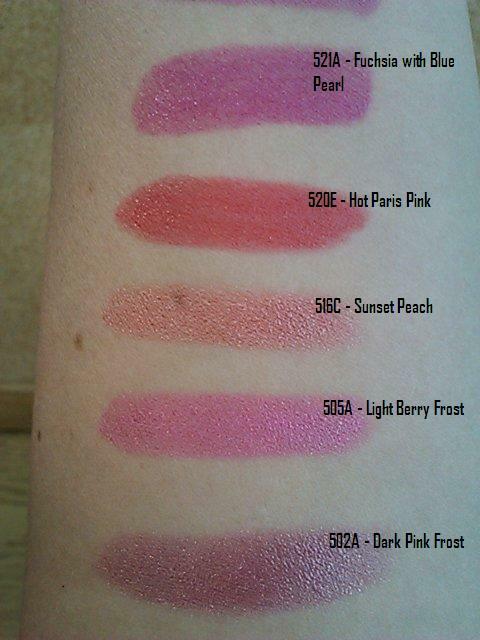 505A - Light Berry Frost ----- SEE LIP SWATCH HERE! 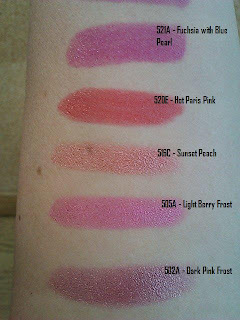 502A Dark Pink Frost ----- SEE LIP SWATCH HERE! I am very impressed with your article. Keep it up and Good luck with your future post. Visit my site too indicated below. Pretty and Cute - Asian BB Cream Haul!! !